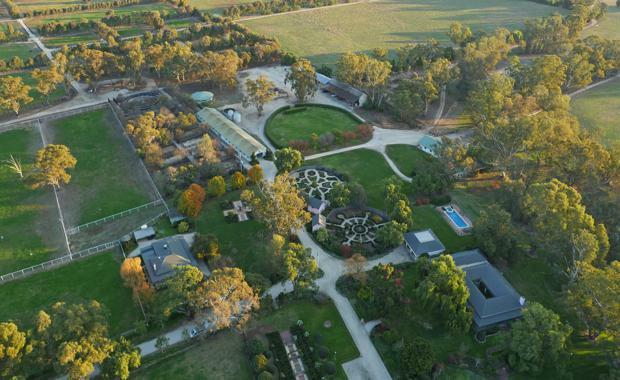 One of Australia’s most prestigious and highly decorated racehorse breeding facilities has been listed for sale. Wood Nook Farm, owned by Bob and Rosemary Scarborough, is located in the heart of Nagambie, commonly referred to as ‘Victoria’s Thoroughbred Capital.’The 122 hectare property offers outstanding fit-for-purpose infrastructure, extensive frontage to the picturesque Goulburn River, and numerous high quality structural improvements. Acquired in 1994 by the Scarboroughs, the property has undergone substantial renovation and capital investment, and currently comprises an historic four bedroom main homestead (circa 1870), triple car garage, in-ground swimming pool and spa, spectacular manicured gardens and a four bedroom manager’s residence. The breeding operations are well-supported by a large, modern stable complex (23 loose boxes), veterinary building / staffroom, chemical shed, hay shed, machinery shed, eight horse capacity walker, undercover sand roll, numerous paddocks and yards, outstanding fencing infrastructure and an extensively developed laneway system. CBRE’s Danny Thomas, Duncan McCulloch and James Beer have been appointed to conduct the sale. “Wood Nook Farm represents a rare opportunity to acquire a trophy asset with an illustrious track record of producing some of Australia’s finest racehorses. The property has an undeniably rich history, and given the scarcity in which properties of this calibre are offered to the market, we are expecting strong interest in the sale, both domestically and abroad," Mr Thomas said. Wood Nook Farm is being offered for sale via a forthcoming Expression of Interest campaign.